^ Landis, Tony R.; Jenkins, Dennis R. (2005). 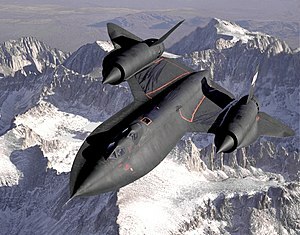 Lockheed Blackbirds (revised edition ed.). Minneapolis, Minnesota: Specialty Press. pp. 56-57. ISBN 1-58007-086-8. ^ Merlin, Peter W (July/August 2005). “The Truth is Out There... SR-71 Serials and Designations”. Air Enthusiast (Stamford, UK: Key Publishing) (118): 2–6. ISSN 0143-5450. ^ Asker, James R. (2001-02-12). “Dyslexic Factoid, Unexplained”. Aviation Week & Space Technology 154 (7): 25.